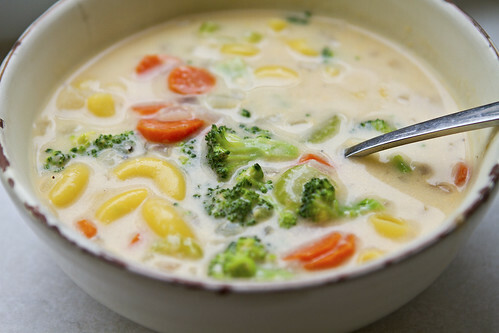 All this rainy weather has me wanting soup for pretty much every meal. I was excited to try this recipe, from Skinnytaste, since I love broccoli and cheese and I really it. I kept the leftover noodles and soup separate in the fridge and just added them together when I was ready to heat them up eat. It kept the noodles nice and firm and gave me a delicious, healthy lunch for 3 days. I shared some with my 2-year-old for his lunch one day and he loved it too! Boil pasta in salted water according to package directions for al dente. Drain and set aside. Chop onion, carrot, celery, garlic by hand or mini food processor. In a large soup pot or dutch oven, melt light butter. Add chopped vegetables and sauté on low heat until soft, about 5 minutes. Add flour and fresh pepper to the pot and stir until smooth. Slowly add chicken broth, milk, nutmeg and dry mustard powder; whisking constantly. Set heat to medium-high until it comes to a boil. Cover and cook on low about 10-15 minutes. Add broccoli florets, parmesan cheese, and stir well. Adjust salt and pepper to taste. Cook uncovered until broccoli is cooked, about 5 minutes or more to your liking. Add cheddar, mixing well until cheese melts and immediately remove from heat. Add cooked elbows and mix well, adjust salt and pepper if needed. Eat right away so the pasta doesn't absorb all the broth.